A commute program is good for business. It can improve employee recruitment and retention, attendance, productivity and morale in the workplace. Employers can reduce payroll taxes (roughly 9% of subject wages) and employees can lower their commute costs by up to 40%. View the Marin County Commuter Toolkit: Building a Successful Employee Commute Program, a good resource developed with community partners including the City of San Rafael and the San Rafael Chamber of Commerce. 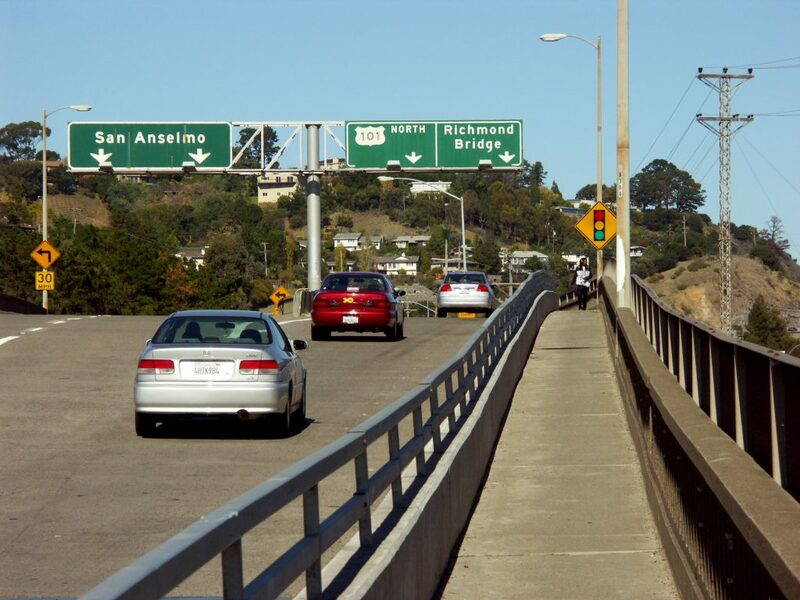 Many employees working in Marin are interested in learning more about commute and teleworking options, as revealed in this 2013 survey: The Marin Commuter: Commute Survey and Focus Group Report. More information and resources also can be found at 511.org Employer Services. Not all ideas or strategies will work for every organization. Depending on the size of your company, scheduling needs and where employees live, different approaches will be more appropriate than others. A good first step in developing a commute program is to survey your employees to gain an understanding about their current commute patterns and needs. Visit 511.org for more information. Visit the program page for more information, program rules and to register your organization. Preferential parking for carpools and vanpools can be provided near the entrance to your building. Bicycle amenities such as lockers, showers, changing rooms and secured bike parking can help employees hop onto their bike instead of into their car. In addition, partner with a local bike shop and offer bike tune-ups and bike maintenance classes to your employees. Car/bike sharing can help employees get workday appointments and errands done. Provide fleet cars and loan bikes to employees, or participate in a carshare or bikeshare program, where available. Monetary incentives can entice employees to switch their commute mode. Provide subsidies to employees who use alternative modes. A parking cash-out program reimburses people for not using a parking space at work. Charging for parking provides a disincentive to drive as well as creates a fund that can be used for a parking cash-out program, a bike loan program, or other incentives. Compressed work weeks and telecommuting means driving to work less. By allowing employees to work a full-time schedule in fewer days, you can reduce commute trips. Flexible working hours help employees with certain commute needs, such as the timing of carpools and bus schedules. Make sure your employees have enough flexibility in their workday to accommodate these types of commutes. Teleworking is a great benefit Marin County employers can offer their employees — and it also goes a long way in helping to reduce work-related traffic congestion. Teleworking or “telecommuting” replaces work-related travel with telecommunications technologies. It refers to working at home or another location on a full- or part-time basis. Many employees telework only once or twice per week, while others telework full-time and occasionally go to the office. Research has shown that teleworking not only benefits employees, but employers as well. Often, supervisors can expect more productivity and higher quality work from teleworkers because they are less stressed and distracted in their flexible work environment. Below are some tips to help you effectively spread the word about your commute program and encourage employees to participate. Find employee champions and leaders to help promote your program. Establish a list of employees who already use alternative modes and show employees that their coworkers have already had success using different modes of transportation. An employee committee can help raise awareness, answer questions, and develop marketing material and promotions. Communicate often. Send periodic email reminders about your program. People’s schedules and commutes change. Re-send informa:on once a month to remind employees about the benefits of the program. Seek the leadership of the owner or CEO of your company and ask them to walk or ride a bicycle to work and say a few words about alternative transportation. It will show employees that the whole company is committed to changing the way it commutes. Hold periodic drawings/raffles for employees using alternate modes. This creates publicity for your program. Offer anyone who is carpooling, vanpooling, walking, biking or riding transit a free raffle ticket for prizes plus a spotlight in the company newsletter. Include commute options information in new-hire orientation packets and follow up with an e-mail after a new employee starts work. Employees are starting a new commute pattern when beginning a new job, so this is a great time to encourage them to try a new mode. Emphasize the financial incentives or disincentives as well as special programs or amenities (such as a vanpool or showers and lockers for bicyclists). Individualize your program. Involve employees in the promotion of your program by highlighting personal commute stories. Help employees find carpool and vanpool partners that live near them and locate nearby Park & Ride lots. Host a commuter fair for your employees or include transportation resources at existing health and benefits fairs. Invite transit agencies, bicycle organizations and shops, vanpool companies and others to serve as resources and answer questions employees may have about different commute options. Be creative and make it fun. Use light-hearted marketing campaigns and imaginative promotions to create buzz about your program.